Ghislaine Leung’s Constitution opened at the Chisenhale Gallery on the 25th January 2019. The work explores the notion of withdrawal and dependency, utilising noise-cancelling technology to define a sonic space. The work is manifest when a series of guidelines are followed, the size of the door, the internal space. In this way, the piece controls its own space of exhibition, serving as an institutional critique. Each of the works, despite remaining as seperate pieces, sit together as a complete installation, one that raises a series of questions. The exhibition is accompanied by an interview by Ellen Greig. The work attempts to redefine the interior space of the gallery through a series of interventions. Leung reduced the size of the entrance to the exhibition to a standard sized door, entitled Closer. Another piece, Flags, consists of the doors within the space being painted black. Toons consists of the walls being painted gloss white. The effect of such interventions is to make the viewer aware of the space that surrounds them. Leung is concerned with the juxtaposition between transparency and opacity, and how the viewer relates to spaces of exhibition in this way. The title of the exhibition Constitution, relates to what Leung calls “constitutional critique”. The intention of the show is anthropocentric, focussing on the relationship that people have with institutions and standardisation. The highlighting of the doors, the drawing of attention, reminds the viewer of their ergonomic relationship to the space, that which is often forgotten. As one moves around the exhibition, the pink noise generated by Kiss Magic Heart defines individual spaces as the sound shifts and morphs. The sound is abstracted from recordings of Kiss, Magic and Heart radio. 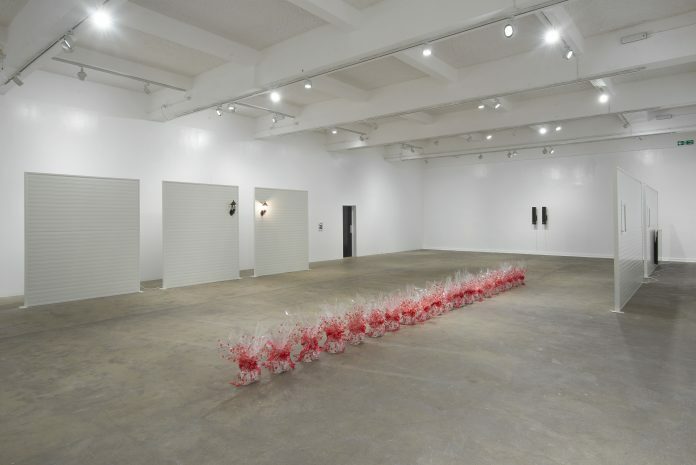 Leung’s use of noise cancelling technology in this way is highly inventive, although it can be suggested that the effect would be greatly enhanced with fewer people present in the gallery. In this manner, many of the works appear dependent on individual experience – there is something inherently personal about the environment created through the combination of these works, a home space. Leung draws upon the emotional responses to home through the use of light and warmth. The work Children comprises in part a nightlight and a radiant heater. There is a warmth to this piece, reminding one of the safety of the home space. The soft light reminds the viewer of the serenity of sleep. The room is dissected by a series of 20 wrapped gifts, Bosses. Each piece consists of a pair of the “The Boss” mugs. It is surely the most bizarre element of the installation, appearing entirely distinct from the rest of the show. In this way, it is difficult to ascertain a clear meaning, it is perhaps the least successful of all the artworks in the show. In the interview, Leung suggests that the work “a romantic, to me anyway, a proposal for equality and community”. This is the straining point of the exhibition, for it often appears that the works’ meaning is deeply concealed and generated through complex web of tenuous relations, those that cannot often be drawn out the pieces themselves. The meaning of artworks need not be explicit; however the meaning of Constitution appears overly allusive. One interesting element of Bosses, however, is that it creates a dialogue in the creation of art itself. Each pair of mugs, entitled Bosses II is an edition in its own right, only constituting the overall piece, Bosses, when they are shown together in exhibition. This is of particular interest when considering the nature of the contemporary art world, and the commercialisation and subsequent fragmentation of artistic intent. The exhibit succeeds from an experiential perspective, however, reminding the viewer of the experience of home. The walls that frame the room are cold and mass-produced, presenting an interplay between the often oppressive nature of the contemporary metropolis, and the softness of the internal space. The panels, pre-fabricated for the construction of offices, have been appropriated by Leung for a new use. Breaks in the panels suggest the contrast between entrapment and freedom, the internal and the external. The constant noise, shifting as one moves around the space, is suggestive of the urban sprawl, the sound of the crowd. Reading through the interview with Ghislaine Leung, published in the introductory materials for the show, it is difficult to reconcile the artist’s intent with the works on show. There are a number of meanings that the works appear to speak to, but at times they do not align with the artist’s intent, as shown in the interview that accompanies the exhibition. Leung’s direct interventions within the gallery itself are certainly intriguing, for they herald a reconsideration of spaces of display. The execution of the work is also impeccable, utilising relatively new technologies to present a fresh approach to the creation of installation works. The show is fundamentally about an act of intuitional resistance, of anti-passivity, for it seeks to ensure that the the visitor is aware of the space in which they are standing, the street in which they walk, and the home in which they live. The work succeeds in this manner; however there seems to be an occasional misalignment between the artistic intent, and what is manifest in the pieces themselves.